Beijing - More melamine-tainted milk powder, which caused the deaths of six children in 2008, has been found in a northwestern dairy plant, once again raising concerns over poor supervision and management of food safety. However, whether the 64 tons of problem products seized from a dairy plant in Qinghai province in late June were leftovers from the original batches of melamine-contaminated milk powder remained under investigation, the provincial quality watchdog said. Six children died and 300,000 were sickened in 2008 from the contaminated milk. "The latest discovery is very likely to be traced back, again, to that killing scandal," Wang Dingmian, former chairman of the Guangdong Provincial Dairy Association, told China Daily on Friday. "It should have been thoroughly destroyed but instead it was secretly stored." This is the second time this year that contaminated milk products have been found. In late January, three domestic companies were caught selling melamine-tainted milk products, which health authorities confirmed were made from leftover tainted milk powder. According to Wang Dingmian, the seizure calls into question the repeated government commitment to improve food safety and the effectiveness of a 10-day inspection launched by the government in February to track down and destroy the 2008 tainted milk products nationwide. He blamed that on loopholes and poor skills in supervision. He said companies can just transfer products to other locations, adding that most dairy companies involved in 2008 issued recalls but none of them had ever said the tainted products had been destroyed. Test samples of the milk powder seized in June showed up to 500 times the maximum allowable level of the chemical, said the local quality watchdog. Police traced the source to the Dongyuan Dairy Factory, in Minhe county of Qinghai province. Another 12 tons of processed tainted-milk products were seized. Three samples of powder had been sent for testing to neighboring Gansu province's quality control bureau on June 25. The bureau called police after test results showed the samples had excessive levels of the chemical. The owner and production director of the factory have been detained. Wang Zhongxi, deputy chief of the quality control bureau in Gansu, said unscrupulous traders had bought batches of the old tainted milk and planned to process and resell it. About 38 tons of raw materials were purchased from North China's Hebei province, the source of the toxic baby formula scandal that brought down the Sanlu dairy company, police said. Milk powder produced in the plant was mainly sold in East China's Zhejiang and Jiangsu provinces. Only a small amount was sold in Qinghai. Zhejiang's food safety commission said on Friday that they had seized three tons of Dongyuan milk powder in food processing factories in the province. The tainted milk powder, in 25-kg packages, was mainly used to produce dairy products like ice cream, said the commission. Most of the contaminated milk powder was still being processed and had not entered the market, it said. Health Minister Chen Zhu said earlier that technological limitations affect the task of destroying the original batches of milk powder. "That's not reasonable at all," Wang Dingmian noted. "As an industry expert, I had submitted a proposal on how to destroy the melamine-laced products in a cost effective and environmentally friendly way but they never listened." Also, the responsibility to oversee the destruction needs to be clearly defined among government departments including health, quality control and commerce, he added. Despite the fact there was only a relatively small amount of leftover milk powder in the hands of traders and plants, he didn't think a repetition of such an incident was out of the question. Starting in 2004, many dairy plants in China began to add melamine, a chemical used in industrial processes like plastic manufacturing, to watered-down milk to make it appear rich in protein during quality tests, industry insiders said. Health problems from the chemical include kidney stones and kidney damage, according to the World Health Organization. The maximum amount of melamine allowed in powdered infant formula is 1 mg/kg and the amount of the chemical allowed in other foods and animal feed is 2.5 mg/kg, the WHO said in standards issued earlier this week. That's in line with the Chinese standard put in place after the 2008 milk scandal. 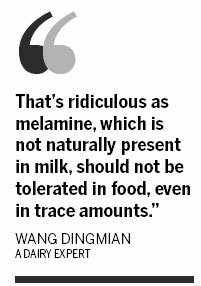 "That's ridiculous as melamine, which is not naturally present in milk, should not be tolerated in food, even in trace amounts," Wang Dingmian said. Meanwhile, in Jilin city, Northeast China's Jilin province, authorities were testing samples of milk powder suspected of having excessive levels of melamine, the city's industry and commerce bureau said on Thursday. The bureau seized more than 1,000 packages of milk powder produced in neighboring Heilongjiang province from a store after a random test on June 22 found one of them had high melamine content.